You've probably noticed we are adding new information to GTS. One of the newer services is Radar Horses. Essentially, we record information from races at the more popular tracks, looking for horses that outrun the class of the race. For example, a claiming horse that runs a final time at the distance/surface that's on par or better than a higher rated allowance race. Sometimes in the course of our review, peculiarities emerge. One of those can't miss oddities is the number of horses that made our Radar Screens on November 7th at Aqueduct. Six horses in nine races outran their class. We haven't seen that before in the short time we've been chronicling the races. Perhaps it was due to the new moon cycle beginning on the 7th at 11:02 Eastern, not too far from first post. Whatever the reason, Aqueduct either ran fast that day on a "Muddy" to "Good" track or a bunch of unsuspected, top-form horses were entered. Whenever a horse player sees such an anomaly, they must take note and consider marking those outings as "key races." It's likely that a few of the non-winners on the 7th could go unnoticed, yet pop at a decent price next time around. You can review Aqueduct's results for November 7th here and watch the races here, just set the date to November 7, 2018. Let's get into the important races, identify the Radar Horses and some others that might could play major roles in upcoming races. In the first, Radar qualifier FACE IT blew the field away in a Maiden Special Weight race for $70,000. She won by 10 lengths after starting fourth by 1 1/2 lengths at the quarter pole. She had some early company with ACTING CHIPPER but drew off when jockey Jose Ortiz asked for more with about 3/16th from the wire. FACE IT was the chalk, bet down to $0.50 and is one you'll want to ride when she hits the track. Of course, we'll alert our pro-subscribers with bonus commentary when FACE IT is ready to strike. Another you might want to follow is ACTING CHIPPER. She ran a solid 6-furlong time but might have run into a monster horse. 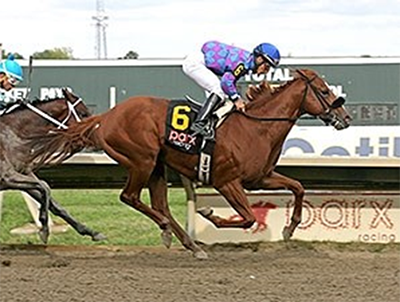 In the third, ANALYZE THE ODDS ran a 7-furlong time at claiming $40,000 that tops through the November 11th, eclipsing $200,000 stakes and $75,000 allowance winners. ANALYZE THE ODDS pressed the pace out of the gate, running second by a length at the 1/4 pole and second by a 1/2 length at the half-mile marker. REGAL QUALITY challenged into the stretch but missed by 1/2 a length. While ANALYZE gets the gold medal and qualifies as a Radar Horse, REGAL QUALITY nearly ran the same race, you might pay attention the next time trainer Todd Pletcher enters REGAL QUALITY, he could offer some nice value. MISSLE BOMB won by a nose in the fourth as the $0.20 favorite in a 6-furlong, dirt race. Through November 11th, MISSLE'S final time of 1:11.34 was the second fastest time at the distance/surface and it was at claiming $25,000, which was faster than a $66,000 allowance race. BENEFACTOR essentially ran the same time, missing by a nose after giving up the lead in the stretch. Both horses are worth watching next time around the track. Skipping forward the sixth, a $35,000 claiming race, MY GIRL ANNIE ran a mile on the dirt in 1:37.41, sandwiched between a $100,000 stakes winner that ran 1:37.39 and an allowance $62,500 that finished at 1:37.78. She can clearly step up in class if she runs the same race. ANNIE smashed the second-place finisher and is the only horse to follow out of this race. Again, we will notify our subscribers the next time MY GIRL ANNIE is scheduled to race. FULL SALUTE is another of our Radar Horses that ran away from the pack in the seventh. Jockey, Joel Rosario rode FULL SALUTE to a final 6-furlong dirt time of 1:10.46 at claiming $32,000. To date, it was the fastest time at the distance/surface, almost a full second faster than the next closest, which belongs to fellow Radar Horse MISSLE BOMB. Two others from the seventh might be worth watching include HELOOKSTHEPART and GETOFFMYBACK. While both finished 3 1/4 lengths behind FULL SALUTE, their final times would still rank in the top five at six-furlongs on the dirt, meet-to-date. The last horse to make our Radar list is SHAMROCK KID, who broke his maiden at 1-mile on the dirt. Although his maiden claiming $40,000 time ranks sixth, 1:37.80 tops a $150,000 stakes winner, a $70,000 maiden special weight winner, and is 0.02 second behind an allowance $62,500 winner. That's great company for a maiden claimer. 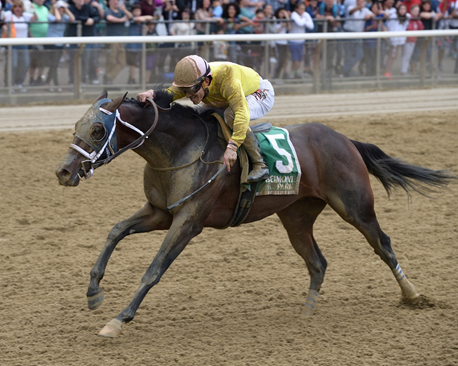 The New York bred SHAMROCK KID nosed out the W versus CUARENTA; so, both are worthy of consideration going forward. As you can see, November 7, 2018 was a special day at Aqueduct. Make sure you keep it here as we'll continue to highlight horses that run above their class and might provide betting value next time around the track. GET OUR FULL CARD GULFSTREAM PARK WEST PICKS!